Madness is right-these blooms are crazy big, up to 11" across! And the colors aren't about to hide, either, the delightful, neon-orange blooms are streaked randomly in pink, and pop in contrast to dark stems. 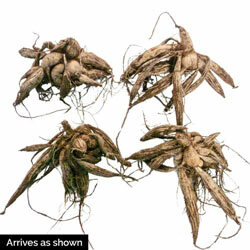 The stems actually remain relatively compact, for a 40-42" plant. It's very rare a dahlia's foliage is notable, but we find this feathery, ruffled foliage surprisingly attractive. Mango Madness Dinnerplate Dahlia won the 2009 Derril Hart award, and in the same year got the highest score of giant seedlings in trial gardens across the US. It is an esteemed performer. 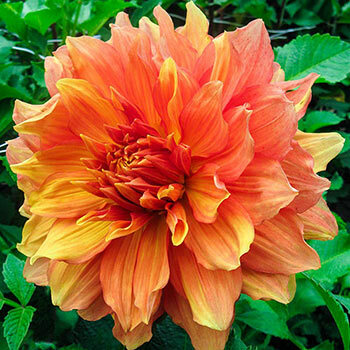 Like other dahlias, it grows quickly and easily, and isn't bothered by deer.